In the midst of the Great Depression and on the heels of Prohibition's repeal, Carl and Sue Dire dared to open a bar in south Denver at the corner of University and Ohio. The tavern was named for the adjacent neighborhood, Bonnie Brae — then a struggling housing development. While much has changed around the tavern, the tavern itself has changed little. 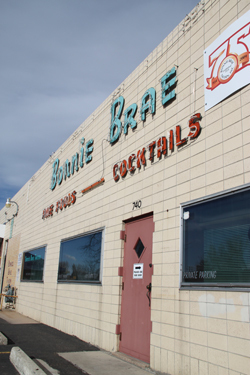 The Bonnie Brae Tavern is still outfitted with teal vinyl booths and swiveling barstools, while its walls pay homage to its roots — both geographic and familial. For decades, Denverites have flocked to the tavern for pizza, comfort food, cold beer and a hearty welcome. Most notably, the tavern has stayed in the family; today Carl and Sue's grandchildren and great-grandchildren are at the helm. This seems to be a very nice blend. If it's as comfy to the touch as it feels, I'll be happy. The same goes for the other 2 shirts that I ordered, the Ski Train and the Colorado Flag T-Shirts. Great T-Shirt, great neighborhood restaurant! t-shirt on loyaltee.com so I purchased one. Love the t-shirt as much as I love the BBT!